Large 180cm x 80cm (approximate) dimension scrim scarf, soft enough for wearing on the face and neck. Made of 65/35 Cotton Poly netting, the scrim scarf is larger than the standard UK scrim scarf, with the squares of netting being approximately 5mm square. The edges of the scarf are finished with cotton tape, sewn down to prevent fraying. The scrim scarf is lightweight, for easy carriage and wearing. It can be stretched out to make an improvised hide, or to camouflage the head, face and shoulders when lying prone. The scarf is large enough to be cut up into two or three smaller scrims, or for additional ghillie over the shoulders and head. 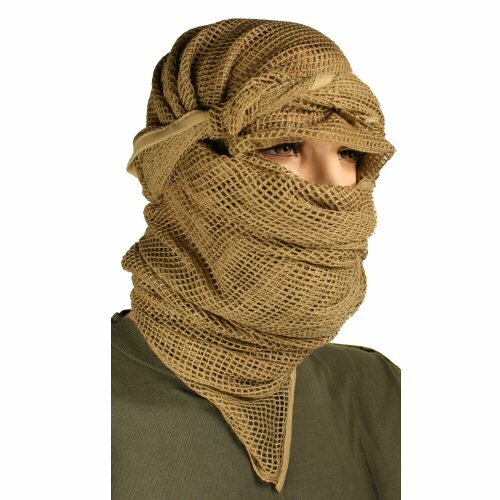 When worn, the netting can be used to hide the face over the eyes without too much restriction of vision. The coyote tan version is not printed, so both sides are plain coyote tan. This colour is not as dark as coyote brown, but is darker than desert sand. The quantity of fabric also make the scrim scarf useful as an improvised towel which can be used in damper conditions where a normal towel or mop cloth can not hang dry, such as the back of a vehicle. Also useful for making an improvised partial shade. A versatile item with many uses.